This is my first custom suit from Indy and all I can say is I'm very impressed. I asked Indy several weeks ago if this was something he would make and after many emails the following suit emerged. As for the suit itself I had it made with several additional options which upped the price, but OHHH was it worth it. The fit was also spot on, I had my local tailor make a few minor adjustments, but nothing major. (best to get measurements from a professional tailor/clothier) Overall I am very pleased both with the product and with Indy himself. Indy has answered countless emails and has taken the time to answer every little detail, and for that I am a customer for life. 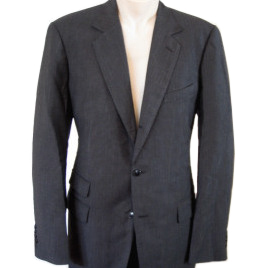 As far as a few quick suit details, the slim fit was probably the most challenging aspect of this suit to get right. (the pics shown are of my suit with the pronounced tapered waist) However, between Indy and a few alterations from my tailor this suit looks every bit a Tom Ford bespoke.. razor sharp lines, shimmering wool, tab adjusted trousers, and even down to the 5 button functioning sleeves. This is a suit I am proud to own and would recommend Indy's product to anyone looking for an affordable, high quality, and unique garments. And for you Bond fans out there....well you know what a suit is all about.